Filipendula rubra, is closely related to our aspirin-producing wildflower Meadowsweet, or Filipendula ulmaria that foams in ditches and water meadows. They do things bigger in America and their form of Meadowsweet, known as the 'Queen of the Prairies', is a whopper. 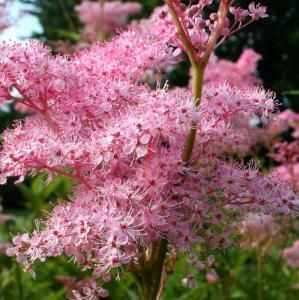 The pink version, Filipendula rubra 'Venusta' is a noble plant that looks exotic in a midsummer border and carries on looking good throughout July. 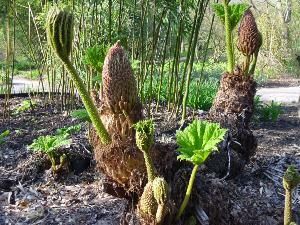 Gunnera manicata is an amazing Brazilian Jurassic giant of a plant with leaves up to 6ft (180cm) across. Giant rhubarb describes it well but is unrelated. 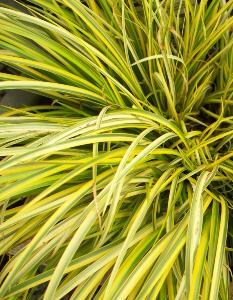 Pictures do the best talking.With a near tropical origin it is strange that this brute grows so well in Britain. Even though the frost gets the leaves in early winter, they start showing signs of life as early as February and grow from nothing to up to 6ftacross by June. 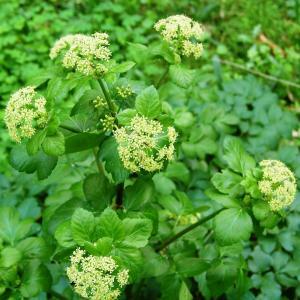 Smyrnium olustratum, or just known as Alexanders is a beautiful, lime green plant that was introduced to the UK by the Romans, who called it the ‘pot herb of Alexandria’, because every part of it is edible. 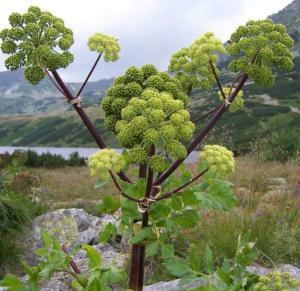 These stout plants resembling and related to angelica grow to 150cm high, with a solid stem which becomes hollow and grooved with age. People say it tastes similar to angelica and parsley, with a hint of fennel and the great thing is that it springs forth, bright and new, in November and December, great timing to make a really superb Gin – just marinade the fresh leaves in the liquor for a few days and serve with tonic and a slice.